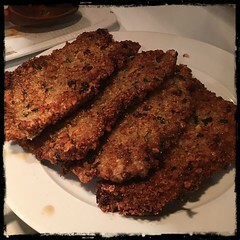 When made with homemade breadcrumbs the ubiquitous veal cutlet goes from simply delicious to sumptuous and delightful. 1. Preheat 3-4 tablespoons of Avocado oil in a frying pan. 3. Fry until golden brown, flip to cook other side. 4. Garnish with flat-leaf parsley.